... accelerating the market's slide into the Dec 24 bear market which lasted all of 5 minutes before a combination of Mnuchin's invocation of the PPT (and bank liquidity check), Trump's urge to buy stocks as it was "a tremendous opportunity to buy", a massive pension fund rebalancing buy order and Powell's dovish U-turn sent stocks soaring, CTAs are back to where they were for the most part since 2016: long. 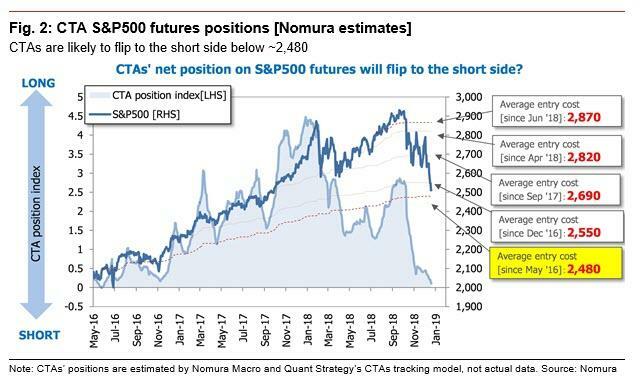 This reversal was previewed last Thursday by Nomura's Charlie McElligott, when we discussed the imminent CTA reversal in "Trading The Powell Capitulation: Nasdaq Meltup On Deck As CTAs Turn "100% Max Long." The reversal also comes, as McElligott previously warned, as a result of the mechanical artifact of Feb 2nd and Feb 5th 2018 dates “dropping-off” from the 1Y model window, as the current weight for the 1Y window is 84.3% of the overall model allocation — and cumulatively, those two days a year ago saw S&P futures trade -7.73% / front-month VIX future +20 vols (+130.3%), meaning that CTAs suddenly see clear skies ahead, simply because they no longer see the Feb 5 VIXtermination event in the 1 year rear-view window. 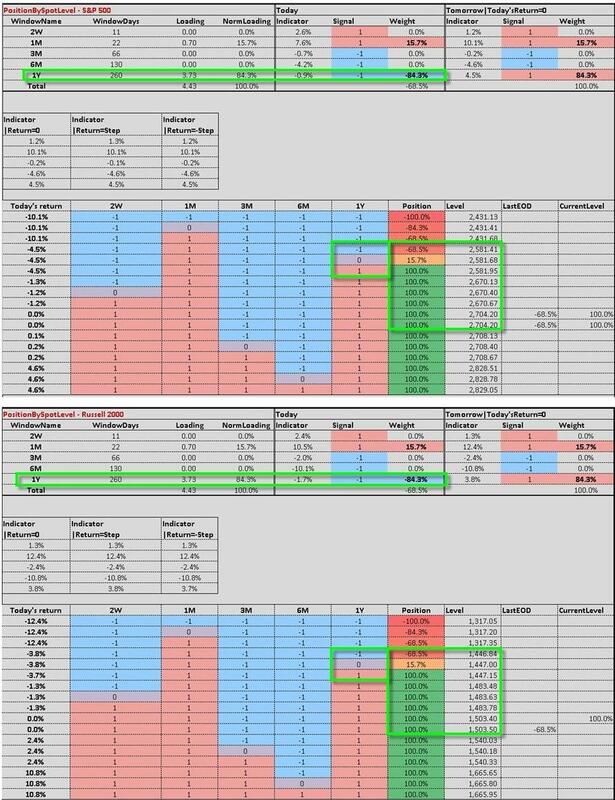 Finally, looking away from US equities, McElligott explains that since the Feb 5th 2018 “vol event” was largely a function of Equities/VIX market structure, "the roll-out dates do not look to cause as much widespread cross-asset calamity as one might think" meaning that within Global Equities, we are likely to see FTSE100, CAC40 and ASX covers to flip Long as well, so expect a muted impact there. 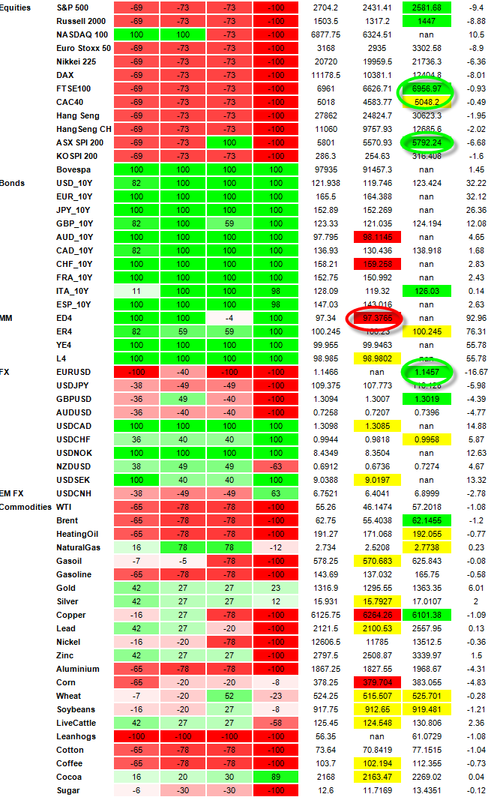 Charlie however does expect the scale of the short in Brent Crude reduced nearly to “Neutral”; the scale of the short in EURUSD reduced (has been unstable / flipping back and forth of late); and the 4th Eurodollar “Max Long” reduced nearly to “Neutral” as examples of higher-profile assets which will be affected.